Solid Foods / Switching to solid foods: FAQ answered! How should I start introducing solid foods? When you think your baby is ready, talk to your doctor about it. Once you have your doctor’s OK, try introducing solids for the first time when your baby is not tired or cranky. It’s best for your baby to be a little hungry, but not starving. To make the experience of eating solids for the first time smoother, give your baby a little breast milk and/or formula first. Then try giving him very small spoonfuls of food, and end with more milk. Talk to your baby through the process; he may not know what to do! And don’t be surprised if most of the food ends up everywhere but in his mouth! You can increase the amount of food progressively, giving your baby time to learn how to swallow solids. If your baby cries or turns away, do not make him eat. Go back to nursing or bottle-feeding for a few days and then try again. Starting solid foods is a gradual process in which your baby will still get most of his nutrition from breastmilk or formula at first. Usually, single-grain cereals are introduced first, but there is no medical evidence that says that introducing solid foods in any particular order is better for your baby. For example, most people believe that introducing fruits first will make your baby develop a dislike for vegetables, but there is no evidence proving that. When introducing single-ingredient pureed vegetables, fruit, or meat, it’s best to go slow. That way you can identify if your baby has an allergic reaction to something. Introduce one food at a time and wait several days before trying another one. Is very important to expose your child to many healthy foods and textures, so don’t give up if he doesn’t want to eat something in particular. Just try it again a few days later! Sometimes, children need to be exposed to new foods 10-15 times before they accept a them; that’s why it’s important to keep offering them to them. 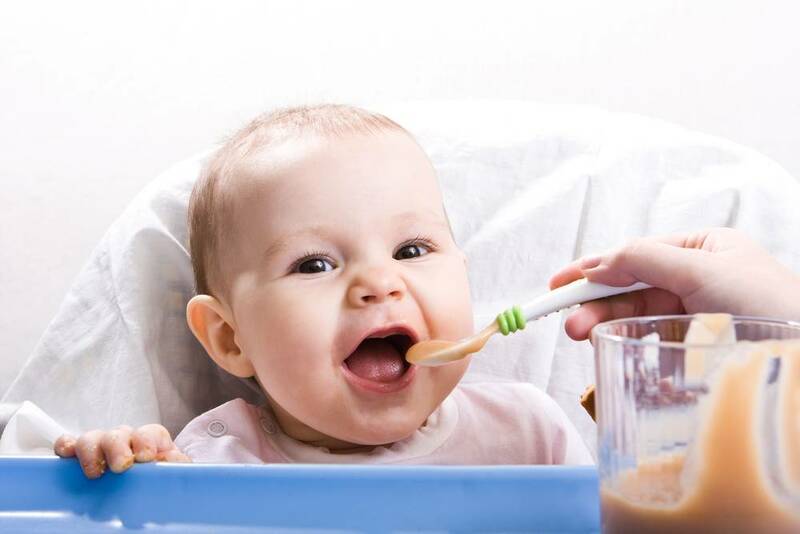 Experts recommend gradually introducing solid foods when a baby is around 6 months old, depending on each child’s readiness and rate of development.